A few weeks before the big day, I give my pupil a ‘mock’ to prepare him for his piano exam (In some cases I will follow this with two or three more mock exam-based lessons). Unlike mock exams held at school, this mock is not marked (at least not as far as the pupil is concerned, although I may have a rough idea in my head). However, I do explain how the ABRSM marking system works – generally some time before this: 30 marks is the maximum for each piece (20 to pass), 21 for scales (14 to pass), 21 for sight-reading (14 to pass) and 18 for aural tests (12 to pass) making a total of 150 (with a pass mark of 100). It is not necessary to pass each section to receive an overall pass mark. Most pupils are aware of the terms ‘merit’ (awarded for a mark of 120 or more) and ‘distinction’ (for 130 or more) but I prefer not to draw too much attention to these as – even if I feel my pupil is easily capable of high marks – I would never wish anyone to feel disappointed if he ‘only’ achieves a ‘pass’. I had one very able and confident pupil who asked me if I thought he’d achieve a distinction. I knew he was actually very likely to score well over 130 marks but I dodged the question and said something like: “You’ve got nothing to worry about and you deserve to do really well but I never predict results.” In fact he passed the exam with a high merit, so I was glad I hadn’t given him what would have been a higher prediction: you can never be sure what will happen on the day, even with seemingly reliable pupils. As a new piano teacher, you may feel the need for a second opinion on some of your pupils and – if you have a good relationship with another piano teacher – possibly your own, you may consider asking him/her to give your pupils a ‘mock’. If you feel confident you can always return the favour, although of course you need to make clear arrangements regarding payment. The only pupils I have ever obtained a second opinion for was my sons. I think, in their cases, I felt too close to the situation and – having heard their practices every morning – could not be certain of giving a totally objective assessment. My former teacher was always happy to help and the comments she writes during the mock often picked up a few things I may not otherwise have noticed. A week or two before my pupil’s exam, I explain in detail exactly what to expect, making sure he/his parent knows where it’s taking place, and the date and exact time (candidates are required to arrive 10 minutes earlier than the start time specified). I usually phone with this information on the day it becomes available but also – to avoid any doubts or mix-ups – write it in the notebook at the following lesson. I also make sure my candidate knows to take his own exam book with him. (Some are surprised by this and expect the examiner to have spare books for every instrument and every grade). I don’t give advice about whether or not to practise at home just before the exam as I think this is a matter of personal choice. (There is a piano in the waiting room of our local examination centre, although most decide not to use it … especially if there are others in the room). My sons always practised as usual in the morning but then went to school and I picked them up and took them straight to the exam. I think it’s generally best to have the mind on other things for most of the day, as too much emphasis on the exam can only add to a pupil’s nerves. I describe the exam room in as much detail as I can, giving an idea of its size and how far from the piano the examiner is likely to sit: I point out that this distance is far greater than the distance at which I sit from the piano, so in some ways the examination should be a less intimidating experience than a lesson. I’m glad to say that, these days, examiners are well-trained in the art of putting a pupil at ease. (This has improved a lot from when I sat my early grades: the examiner was much like a driving-tester and would barely say “hello”, let alone smile or attempt to appear friendly). The only thing I might ‘warn’ my pupils of is that some of the examiners may sound ‘very posh’! (I’ve learned from experience that young people are often taken aback by this and some even struggle to suppress a giggle). I also make it clear that the parent will not be allowed to enter the exam room but will sit in the waiting area until the exam is over. I explain that there is a slight chance another person will be in the room in addition to the examiner – this is in order for the ABRSM to train and moderate examiners. It has never happened to me, nor to any of my candidates, but they should be made aware of the possibility. The only other person who may be in the room – although only at the higher grades – is a page-turner – chosen by the candidate himself, with permission for his/her presence obtained from the examiner. I opted to have a page turner for my grade 8 exam. The first time this was my teacher – then, after I’d failed and had to re-take it (through no fault of my teacher, I should add! 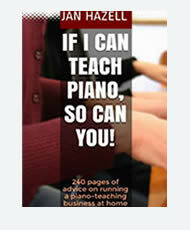 ), she wasn’t available on the day but a piano-teaching acquaintance of hers stepped in. Of course, page turners should always be paid for their time. Before my grade 8 exam, it had seemed like a good idea to have a page-turner: not only would it help the pieces to flow but it also meant I had an ally in the room. However, on reflection, it was not such a good idea for me. No matter how much I liked – and generally felt comfortable with – both my teacher and her acquaintance, I think I felt that an extra presence in the room meant one more person to ‘judge’ me – and this just added to my nervousness. For this reason, I always encouraged my sons to be responsible for their own page-turning, both during practices and in the exam itself. I helped them identify a bar towards the end of a right-hand page or at the top of a left, where only one hand is playing and the page can be swiftly turned with the other. Of course, sometimes this may involve learning the bar on a following page by heart. The alternative is to photocopy a page from the book (the ABRSM does permit this in cases where it’s deemed necessary) and have three or more pages spread across the piano stand. However, I find this less satisfactory as it’s not so easy to have the head turned to one side when reading the music. Also, if the candidate has not seen the piano before, he may overestimate the width of the music stand. I explain that some examiners prefer the candidate to complete a form indicating his choice of pieces, (this can be downloaded and printed from the ABRSM website in advance but is also available at the exam centre on the day) whereas others prefer to ask for the name of the piece orally. (A pupil may struggle to pronounce the name of his piece – particularly if it’s a foreign title. Obviously, he should be given guidance on this but I can’t imagine that a mis-pronounced title would affect the examiner’s assessment). After entering the exam room, the candidate will be asked to adjust the stool to a suitable height and distance from the piano. Following this, some examiners will invite him to ‘try out’ the piano: if they do not, I insist that my pupil requests this himself (and I make sure he practises making this request in the mock so he doesn’t forget on the day). It’s important to remember that, while most musicians will use their own instrument for the exam, a pianist taking his exam at an examination centre is unable to do this for obvious practical reasons. Therefore – as all pianos can feel very different – it is crucial that he is allowed some time to familiarise himself with the one provided. I generally recommend playing something the candidate knows well – such as a simple scale – but varying the volume so he knows how hard to press the keys. The pupil must understand that this ‘try out’ is not marked so it doesn’t matter if he makes mistakes. It is also worth trying the pedal (if it will be needed in any of the pieces) and being aware that the exam piano may have three pedals rather than the two he may be used to. (I have never taught an exam piece which requires use of the middle pedal). My elder son neglected to test the pedals in his grade 5 exam and started playing his piece with his foot on the middle pedal rather than the right-hand one. The examiner kindly pointed out his error, allowed him to restart the piece and didn’t appear to deduct any marks. The examiner will ask whether the candidate wishes to start with scales or pieces and – as I mentioned earlier – I always recommend scales as these provide a good ‘warm-up’. However, I am less dictatorial when it comes to deciding which of the three pieces should be played first. Some pupils prefer to play their ‘hardest’ (weakest) first (to get it over and done with), whereas others start with an easier one as they feel they become more confident and able as the exam goes on. It is generally best to practise pieces at home in the same order as that chosen for the exam. I had one pupil who asked to start with the aural test as she felt talking would help calm her nerves. I telephoned the ABRSM who said they were happy to oblige with this as long as the examiner was made aware of the request in advance. Assuming the pupil is starting with scales, he should remember to listen carefully to which scale the examiner is asking for (e.g. Did he say the right hand or left hand? Was that D major or D minor? Did he want the scale to be played staccato or legato?) Take a second to think before you start playing – rather than starting immediately, making a mistake and having to restart – but, don’t take too long, otherwise the examiner will mark you down as hesitant. It’s important to get the balance just right.